The Workplace Challenge is delivered nationally across England. Inactive employees are the primary target audience for this programme. However, all employees may participate, regardless of activity level and health conditions. What modes/types/domains of physical activity does the programme promote? The programme promotes all domains of physical activity including: everyday activity such as active travel (walking and cycling); active recreation such as dance, and recreational walking and cycling; and all types of sport. Which of the seven best investments the programme addresses? The programme addresses two of the seven best investments: communication and public education; and sport and recreation. What sectors does it involve? The programme involves a wide range of sectors including: sport, public health, education, sustainable transport and economic development; all types of workplace (eg, private, public and voluntary sectors) are eligible to take part. 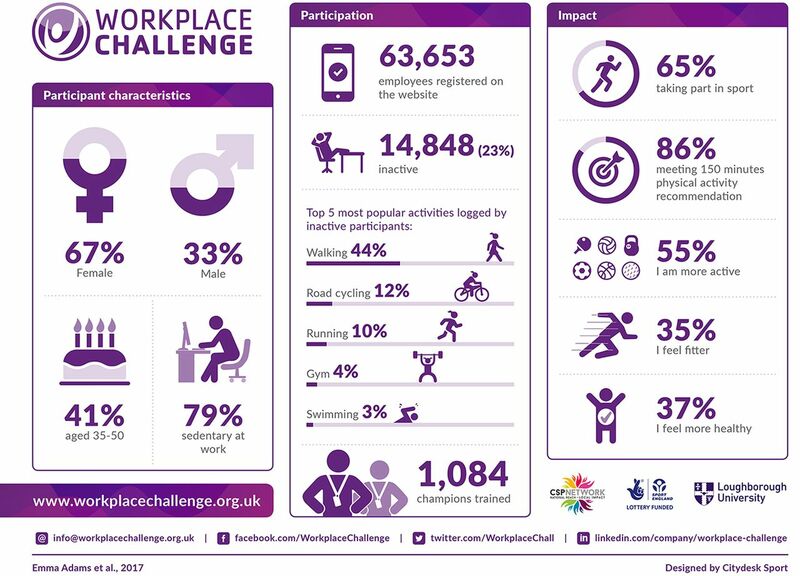 Between October 2013 and April 2017, 63 653 employees registered on the Workplace Challenge website from 11 385 workplaces; 14 848 (23.3%) employees were classified as being inactive at baseline. The programme has been scaled up, has national leadership with local delivery, and a unique combination of online content (activity tracking tools, challenges, community) with local offline support to help workplaces and employees access local opportunities and develop workplace physical activity and sports provision. A high proportion of adults in England are insufficiently active.1 The workplace is an important setting for promoting physical activity with potential to reach a high proportion of adults in employment (74.8%).2 3 The ‘Workplace Challenge’ aims to increase sport and physical activity participation in inactive employees. It is a multi-component programme based around a website/app where employees can track their activity levels and take part in online activity challenges, along with locally organised sports events and competitions, signposting to other local activities and workplace champion training. The programme is led and managed nationally by the County Sports Partnership Network (CSP Network); and delivered locally by County Sports Partnerships (CSPs), National Governing Bodies for Sport (NGBs) and other local and national partners. A variety of strategies are used to market the programme to workplaces and employees. CSPs telephone, email and visit workplaces, attend local business network events, publish in business news journals, use social media, publish press releases, and distribute materials and newsletters using local networks and the local CSP website. Many participants are recruited through word of mouth or workplace promotional activities. The programme includes four key components underpinned by selected behaviour change techniques4 (table 1). Participants can log their activities on the website/app (activity type, duration and intensity), set personal goals and track their progress towards achieving 150 min of moderate-vigorous physical activity (MVPA) each week. Regular national online activity logging challenges are implemented. For example, the 8-week ‘active lunch challenge’ (January/February 2017) encouraged employees to do an activity during their lunch break. Points were awarded for each activity recorded, and leader boards enabled participants to assess their progress against others, either as individuals or as part of a team. Other shorter challenges are offered locally, for example, a 4-week active travel challenge. CSPs and NGBs organise local events and competitions, for example, table tennis competition, social summer cricket, rowing taster session, learn to ski session, corporate football tournament. Finally, workplace champions are recruited and trained to enable them to organise activities within their own workplaces, for example, taster sessions, internal walking challenges or interdepartmental sports competitions. Key results from the mixed methods evaluation (2013–2016) are shown in figure 1. Most participants were female (66.5%), aged 35–50 years (40.6%) and 78.7% had sedentary occupations. The most popular activities recorded by inactive participants were walking, road cycling, running, the gym and swimming. At follow-up, 65.0% of inactive participants were taking part in sport and 85.6% were meeting recommended MVPA guidelines. Inactive participants reported being more active (55%), as well as feeling fitter (35.3%) and healthier (37.3%). From interviews and focus groups with delivery partners, workplace representatives and programme participants, several factors were identified which influenced programme success. The programme is underpinned by overarching principles and structure, but with flexibility to adapt delivery to suit local needs and context; this is an important feature of the programme. The range of activities which can be used to engage employees in sport and physical activity is also important. Support from local organisations, such as NGBs, facilitates the provision of ‘taster’ sessions which are popular with participants, and assists with signposting to local clubs and activities. The programme is attractive to workplaces and employees as it is free and no one is excluded from participating. Several factors are important for engaging inactive employees. Tailoring information and activities for different groups, such as providing low level taster sessions and alternative activities, for example, walking football, are main factors. In addition, there is an emphasis on fun, enjoyable and social activities supporting motivation and participation. The flexible nature of involvement, that is, participating in different components of the programme; trying new/different activities; and logging any activity, completed at any time, on the website/app; facilitates engagement. Finally, the competition element of challenges brings colleagues together, builds positive relationships, improves communication and creates good team spirit and morale, which has benefited business. The workplace setting offers potential for promoting sport and physical activity in inactive adults. However, employers need help to understand the benefits of physical activity for the prevention and treatment of ill-health in employees to increase its priority in the workplace. Effort, time and resource are needed to engage workplace leaders and senior/middle managers to maximise communication, reach, employee engagement and support implementation. Partnering with local sports and physical activity providers is critical, along with providing ready to use resources, including marketing tools, for their use. There is a need to consult with target groups before and during the programme to understand their needs and motivations. This will ensure programmes and communications are tailored to meet these needs, thus increasing engagement and participation. The Workplace Challenge approach provides a solution for engaging inactive adults in sport and physical activity. The Workplace Challenge is delivered through a collaboration of organisations from the sports, physical activity and health sectors in England. The authors thank Leicester-Shire and Rutland Sport who originally developed the Workplace Challenge programme. The authors also thank Sport England, the County Sports Partnerships, British Heart Foundation, CityDesk Sport and all other partners for their support in delivering the programme. Finally, the authors thank the employees and workplaces who have taken part. The evaluation was conducted under the auspices of the National Centre for Sport and Exercise Medicine (NCSEM) England, a collaboration between several universities, NHS trusts and sporting and public bodies. The views expressed are those of the authors and not necessarily those of the funders or the partners involved.
. Health Survey for England 2012. Leeds, UK: Health and Social Care Information Centre, 2013. Office for National Statistics. Labour Market Statistics. 2017 https://www.ons.gov.uk/employmentandlabourmarket/peopleinwork/employmentandemployeetypes/bulletins/uklabourmarket/may2017 (accessed 30 May 17). Twitter Follow Emma Adams at @EmmaJ_Adams and Lee Mason at @LeeMasonCSP. Contributors All authors contributed to drafting, developing and writing this manuscript, which was led by EJA. Funding The County Sports Partnership Network Workplace Challenge was funded through Sport England’s Lottery funded “Get Healthy, Get Active” portfolio (Grant number 2012021691). Ethics approval Loughborough University Ethics Committee.